This is the first release, but a look at the NEWS for jtools prior to its version 2.0.0 will give you an idea of the history of the functions in this package. What follows is an accounting of changes to functions in this package since they were last in jtools. Plots made by interactions now have a new theme, which you can use yourself, called theme_nice (from the jtools package). The previous default, theme_apa, is still available but I don't like it as a default since I don't think the APA has defined the nicest-looking design guidelines for general use. interact_plot now has appropriate coloring for observed data when the moderator is numeric (#1). In previous versions I had to use a workaround that involved tweaking the alpha of the observed data points. 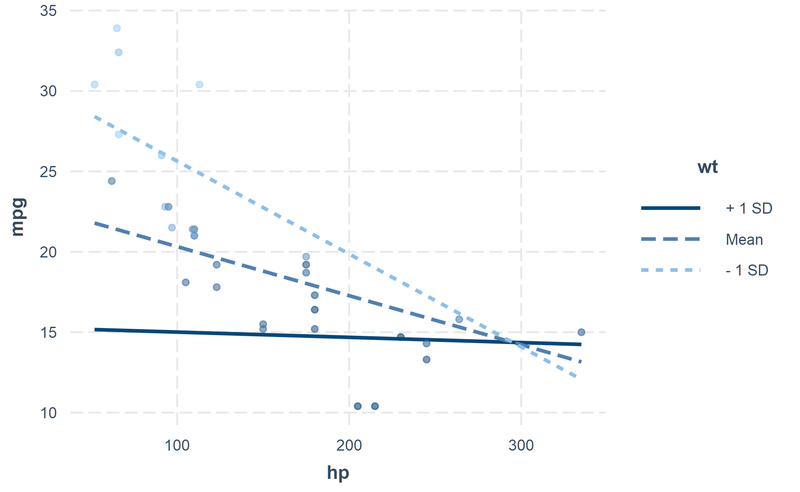 interact_plot and cat_plot now use tidy evaluation for the pred, modx, and mod2 arguments. This means you can pass a variable that contains the name of pred/modx/mod2, which is most useful if you are creating a function, for loop, etc. If using a variable, put a !! from the rlang package before it (e.g., pred = !! variable). For most users, these changes will not affect their usage. sim_slopes no longer prints coefficient tables as data frames because this caused RStudio notebook users issues with the output not being printed to the console and having the notebook format them in less-than-ideal ways. The tables now have a markdown format that might remind you of Stata's coefficient tables. Thanks to Kim Henry for contacting me about this. 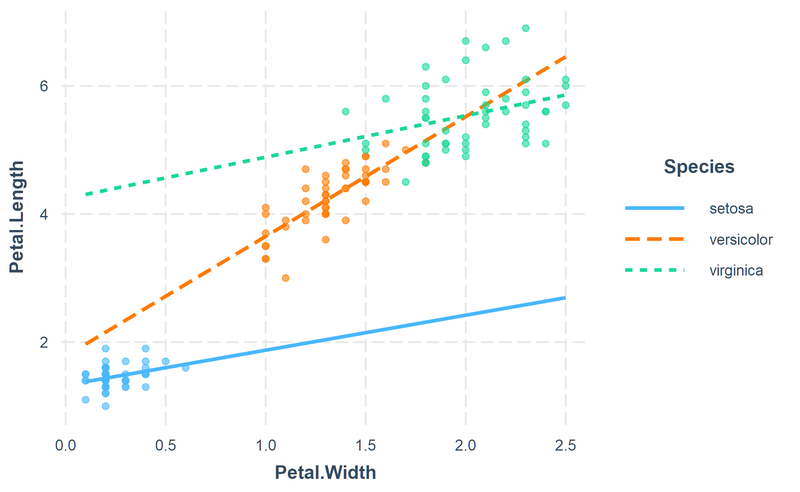 One negative when visualizing predictions alongside original data with interact_plot or similar tools is that the observed data may be too spread out to pick up on any patterns. However, sometimes your model is controlling for the causes of this scattering, especially with multilevel models that have random intercepts. Partial residuals include the effects of all the controlled-for variables and let you see how well your model performs with all of those things accounted for. You can plot partial residuals instead of the observed data in interact_plot and cat_plot via the argument partial.residuals = TRUE. 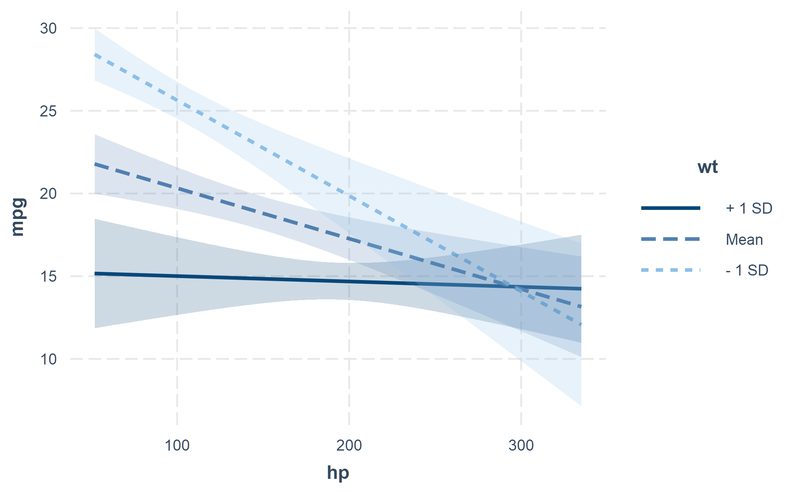 In the jtools 1.0.0 release, I introduced make_predictions as a lower-level way to emulate the functionality of effect_plot, interact_plot, and cat_plot. This would return a list object with predicted data, the original data, and a bunch of attributes containing information about how to plot it. One could then take this object, with class predictions, and use it as the main argument to plot_predictions, which was another new function that creates the plots you would see in effect_plot et al. 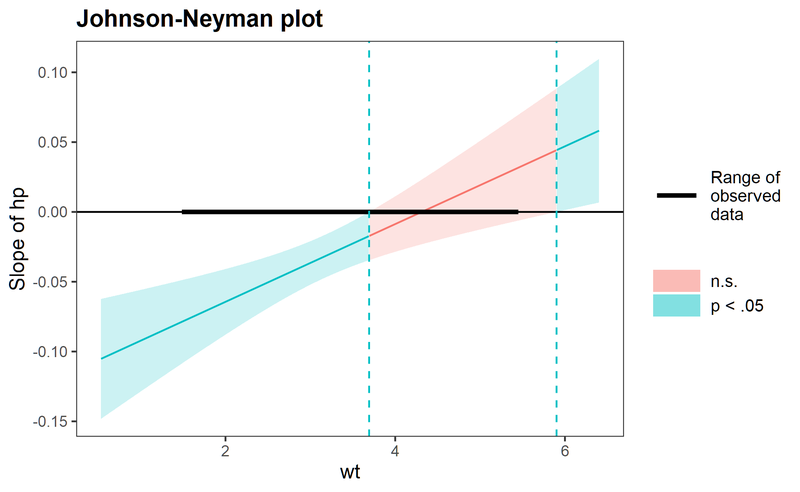 I have simplified make_predictions to be less specific to those plotting functions and eliminated plot_predictions, which was ultimately too complex to maintain and caused problems for separating the interaction tools into a separate package. make_predictions by default simply creates a new data frame of predicted values along a pred variable. It no longer accepts modx or mod2 arguments. Instead, it accepts an argument called at where a user can specify any number of variables and values to generate predictions at. This syntax is designed to be similar to the predictions/margins packages. See the jtools documentation for more info on this revised syntax.